The United States Postal Service has banned all international shipments of electronics with lithium batteries effective May 16. The cost for families to send gadgets via private parcel service to enlisted loved ones in some countries could almost quadruple. Starting on May 16, new United States Postal Service (USPS) regulations will prohibit iPads, Kindles, smartphones, and other electronics with lithium batteries from being mailed to overseas troops or foreign customers. American firms with customers outside the country’s borders or people with loved ones serving overseas will have to use private parcel services at higher prices. The news is a headache for USPS employees, military families, and electronic manufacturers and resellers … but a boon for private delivery firms like UPS, DHL, and FedEx. Lithium batteries, which power many personal electronic devices, can explode or catch fire in certain conditions. In order to get around this, consumer electronic manufacturers such as Apple or Amazon ship their products with a minimal charge–which mitigates the safety risk. Fully charged, improperly stored, or improperly packed lithium batteries do pose a risk of explosion, however. Lithium batteries have been implicated in at least two fatal cargo plane crashes since 2006, including a UPS jet in Dubai. For cargo shippers and postal services, this poses a quandary. Improperly shipped lithium batteries are a serious safety risk. However, shipping of personal electronics is a multibillion dollar business annually. According to the USPS, they will prohibit shipping of lithium batteries and any device containing them effective May 16. In a publicly issued document, the USPS says that the ban was made because of deliberations between the International Civil Aviation Organization (ICAO) and the Universal Postal Union (UPU), two international bodies which issue semi-binding guidelines for global trade. The International Air Transport Association’s (IATA) 2012 regulations for lithium metal and lithium ion batteries, which the ICAO use, allow for the shipment of consumer electronics with proper safety precautions, while the UPU’s lithium battery regulations (PDF) are ambiguously worded–worthy of an entire phalanx of lawyers. Lithium batteries have been implicated in at least two fatal cargo plane crashes since 2006. The USPS tells customers they anticipate “on January 1, 2013, customers will be able to mail specific quantities of lithium batteries internationally (including to and from an APO, FPO, or DPO location) when the batteries are properly installed in the personal electronic devices they are intended to operate.” In the meantime, Americans hoping to send iPads, Kindles, laptop batteries, and smartphones overseas will be forced to either break the law by lying about their package contents or to shell out dearly for higher-priced private shipping services. Neither UPS, DHL, nor FedEx ships directly to APO, FPO, or DPO addresses. 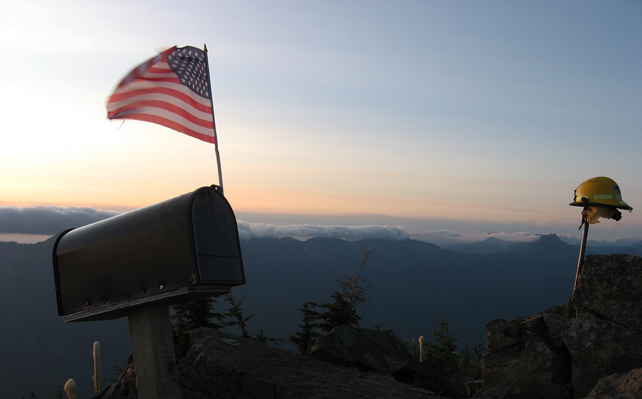 FedEx offers a service for military boxes, SmartPost, which is subject to the same restrictions. After May 16, mailing an iPad to a loved one serving overseas would require mailing it to a civilian address in the host country–which, for a country like Kuwait, would make the price jump from the current Military Priority Mail rate of $5.30 to more than $20. Fast Company spoke to Darlene Casey of the Postal Service, who explained the new regulations. According to Casey, the revision was required by ICAO and UPU standards, both of which prohibit lithium batteries in mail shipments on international commercial air transportation (while allowing them in non-mail shipments such as private courier services). The May 16 start date was chosen “to provide mailers with time to make shipping adjustments”; the Postal Service also acknowledges that the change will be an inconvenience to cus­tomers and that the “USPS is working with expert organizations to determine if any new exceptions can be developed prior to January 2013. 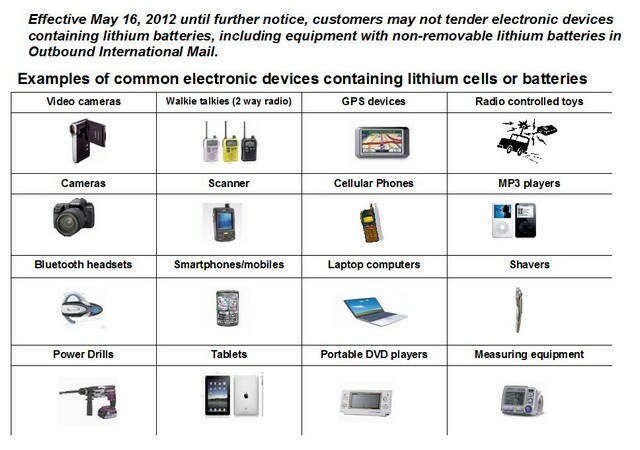 Further announcements will be made should USPS be able to accept lithium batteries in certain types of mail shipments as soon as any new options become available.” As a courtesy, Fast Company was provided with a graphic of consumer electronic items which will be forbidden on outbound U.S. international mail after May 16 (below). Of course, the group hardest hit by the USPS decision are American troops. Service members residing overseas with APO and FPO addresses are served only by the USPS and FedEx. Neither DHL not UPS deliver to APO or FPO boxes; however, both do ship to countries and cities where troops are based. After May 16, friends or family members hoping to send low-cost tablets and e-readers to service members abroad will no longer be able to send parcels by U.S. mail. It’s important to note that the restrictions do not reply to shipping lithium batteries domestically or to American residents receiving lithium batteries; the ban only applies to outbound lithium battery products shipped internationally. Winnie Pritchett of non-profit organization iPads for Soldiers, which ships iPads without any financial assistance from Apple to troops overseas, notes that they currently send the bulk of their iPads overseas via USPS. Pritchett calls the new regulations a case of the Postal Service “shooting themselves in the foot.” iPads for Soldiers sent over 600 iPads to Afghanistan in 2011; each iPad took approximately two weeks to make it from the United States to Afghanistan. According to Pritchett, the iPads are particularly popular with wounded warriors with missing hands–they were able to use the touch-based iPad much more easily than a conventional computer. As private parcel services, FedEx, DHL and UPS all permit shipping of lithium battery-powered electronic devices. UPS’s Mike Mangeot told Fast Company that the shipping giant handles lithium battery-containing electronic devices in compliance with U.S. and international shipping regulations, conducts extensive employee training for handling lithium battery shipments, and audits customers for proper packaging, handling, and documentation of lithium batteries. Although the Postal Service claims to be adhering to international regulations, their strict ban on any international lithium battery shipment is semi-exceptional–among major worldwide postal services, only the Australia Post has a similar regulation. Other major postal services have less stringent rules; the Royal Mail (U.K.), for instance, allows smartphones, iPads, and Kindles while forbidding laptop computer batteries, and Japan Post restricts lithium batteries to slower sea mail. Yet other services, such as the German Bundespost, still allow international air mail of lithium batteries within stringent safety requirements. Another group hard hit by the USPS lithium battery ban are commercial resellers. Aaron Block of bay.ru, an American firm specializing in consumer electronics exports to the Russian market, told Fast Company that “few outside of our industry realize that world’s best express shippers like FedEx, DHL, and UPS still have major challenges in Russia. That said, there is often one preferred shipping solution for any given good.” Hall’s firm will use alternate shippers for the Russian market; the issue is a large one for giants like Apple and Amazon, along with smaller resellers. Other services, such as the German Bundespost, still allow international air mail of lithium batteries within stringent safety requirements. In the end, the USPS’s rush to ban lithium batteries is surprising. Although the Postal Service claims they are just getting in line with international regulations, the Bundespost and Royal Mail either successfully straggled getting in line with overly cautious (and ambiguous) safety regulations, or found loopholes to get around them. The USPS has legendary financial difficulties and a track record of institutional paralysis and poor decision-making. Despite implied promises of a January 2013 policy change, shutting off Kindle exports to Amazon and iPad shipments to American troops is simply puzzling. The root of the matter is that lithium batteries, with proper safety precautions, are safe for air shipping. While it is the job of the ICAO and UPU to enact overly stringent bureaucratic restrictions, a blanket ban offers minimal safety benefits and massive economic damage to the USPS. Correction: An earlier version of this article misidentified Aaron Block of bay.ru.